High-end components and good quality, but is it enough to better its rivals? 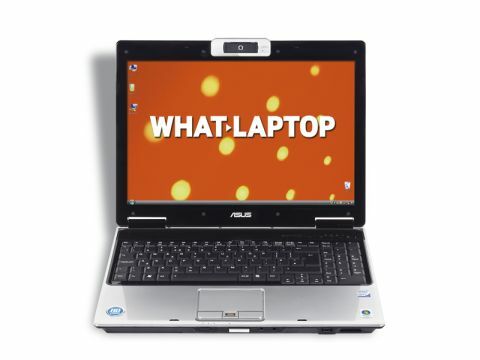 Asus has made a reputation for itself recently with its impressive range of netbooks, but it also produces entry-level, mid-range and high-end laptops. The M51A is a budget laptop, offering one of the best specifications we have seen for the price. The 15.4-inch screen features a 16:10 aspect ratio – which is taller than some of the newer designs. It offers detailed images and colours are bright and colourful. It's one of the Super-TFT reflective panels, however, and it's worth trying before you buy if you intend to work on the move or in direct sunlight. Unlike the other laptops at this price point, this machine offers a high-end Intel Core 2 Duo processor instead of a Pentium Dual Core we see so often. Running at 2GHz, and backed by 3072MB of memory, it offers enough power to cope easily with daily office tasks and matches machines costing twice as much. We found it started and shut down quickly, with little sign of lag, even when running a host of intensive applications. At 297 minutes, the battery life also provides ample mobility. It also shines when it comes to quality. It can't match the portability of the Acer Aspire 5410T, having a much bulkier design, but the patterned plastics are attractive and robust, and the thick screen surround offers plenty of protection. That said, the design looks older than some of its rivals, such as the Packard Bell EasyNote TJ65-AU-010UK and Acer Aspire 5410T. The keyboard offers good usability, with large tapered keys that are easy to type quickly on. There's also a pad of numeric keys alongside it, which aids data entry without compromising the size of the main keys. The plastics have a tendency to flex slightly under use, however. This machine comes into its own features, with a comprehensive range of ports included that puts more expensive laptops to shame. It offers an eSATA interface – letting you transfer files at high speeds to compatible hard drives, and it also comes with a fingerprint reader that adds biometric security for your files and data. Four USB ports offer good connectivity, and you'll even find an HDMI port – letting you connect high-definition (HD) displays. There's also a VGA port for users with older analogue displays. Bluetooth is in place for wireless connections to other digital devices, with 802.11g Wi-Fi and 10/100 Ethernet offering standard wireless and fixed networking connectivity. If it is value for money you are after, then there is simply no better machine than the Asus M51A. Offering components that are usually found on more expensive machines, a comprehensive set of features and great build quality, it's an easy machine to recommend.